Games that could play / be fun on a DDR pad? I was thinking of modding a Playstation DDR pad for use on the 2600 / sega genesis. The question is what games do you think would be the most playable / fun, I will use your suggestions when I am testing. The ones I think so far would be fun are the maze games like Ms. Pacman, and Maze Craze. Some other ones will be Tapper, keystone kapers, freeway and frogger. What are your thoughts and suggestions? Decathlon? Track & Field? Video Jogger? Activision Decathlon is the only one out the bunch I own. I don't know anything about this game, what is the gameplay like? Looks like fun I hope it is a joystick game otherwise it won't work. Yes, it's a joystick game - else I wouldn't have suggested it, considering your DDR pad hack. Beat em Eat em won't work and Bachelor Party won't work either as they are both paddle controllers. Custer's revenge may work though. I don't own any though, they are on my list of games to get. I was going to say decathalon, summer and winter games, track and field. Any game like that. Wouldn't have thought of maze s games, but it would make sense. Love coconuts btw. 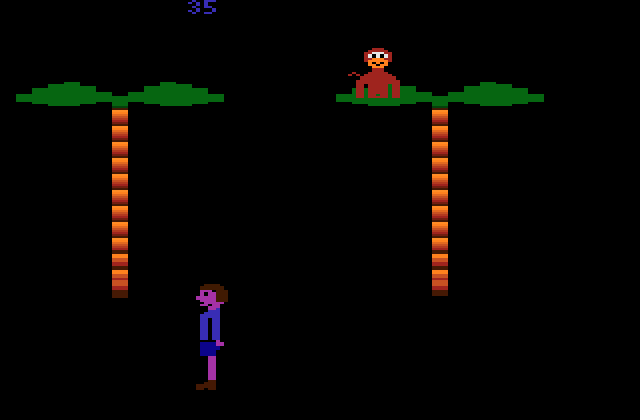 I could have sworn it could be played two playered where one controlled the monkey, but either I'm an idiot, or its just single player. I'll need to look up the instructions on AA. Edited by Video, Sat Apr 28, 2018 5:22 PM. Adventure. Almost be like you are literally walking around. I wonder if the Foot Craz could be re-produced? Any game that doesn't rely on the R / L buttons is playable as the pad includes the directional and shape buttons as well as start and select. I am using a PS2 dance pad as part of my project. Me too! I've got a PS2 dance mat connected through a PSX64 interface to my Atari 8-bit, C64 and other computers (sadly I don't own a working 2600 but in principle it works the same way) and of the games I've tried, Mogul Maniac on the Atari 8-bit is by far the most playable. The Atari 2600 version might a bit more dull but generally it is worth giving it a try. Consider modding a hand held fire button next to the DDR pad to increase the number of potential games, as you don't want to use foot fire unless you're terribly dexterious.